I have written about watches previously over the years, they are a bit of a hobby and there is something about them. I worked with selling them for a few years and I think this is where this mild obsession came from. Yes they are practical, they give you the time and date and some the day, and many will go I have a super computer in my pocket which does the same thing. But that doesn’t look as nice and by the time you have taken it out your pocket or bag and pushed a button I have advised you of the time with a flick of the wrist. Like I said, practical. The thing with watches is that to get watches that look great and actually work well there is a view that you have to spend lots of money. You can obviously buy a Tag Heuer, Rolex or Patek Philippe but if you are anything like me, you just don’t have that sort of disposable income to spend on such a time piece. It used to be that cheaper affordable watches were rubbish and mostly plastic looking metal that would last five minutes before they were six hours behind the actual time. These sorts of useless items can be found on eBay for £3.99 if you are still looking in this way. But once you get off the high street where affordable is still £150, even a £50 watch has Next written on it and I have found them all a bit useless and not looking like a high end watch. This brings me to my point of this blog, the make Burei which is available on Amazon, they range from £100 less but are normally on sale and I have picked up three all for £40 to £50 and they look amazing and work great. True they are not Swiss made inside, the standard Japanese quartz mechanism is just that standard, but they tell the time and come in all sorts of style imitating some top brands along the way. All very simple and elegant and two of mine actually come with working Chronographs. Many watches of a this price range and some higher are pretend and look like working stopwatches but in fact are fake buttons and faces on the watch. But these two work and work well. I have changed one battery and all three hold time perfectly and have not gained or loss any seconds, minutes or hours. 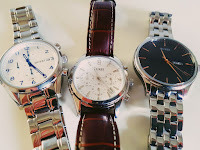 They are certainly a great addition to my watch collection and happy to use them on a daily basis and with different styles to choose from you can build a nice selection to go with any sartorial style. I do have many other watches of various makes and yes some of my automatics are my favourites, and most flashy due to be skeleton but these really do look quality and for such a small price, really are. Check out the latest collection here at Burei, also available on Amazon. Note I have not been paid to write about these watches and have no affiliation with the brand or any agency linked to the brand, my views are 100% my own from experience.